National championships for men and women, boys and girls, Sofia 08.03.2015 years. 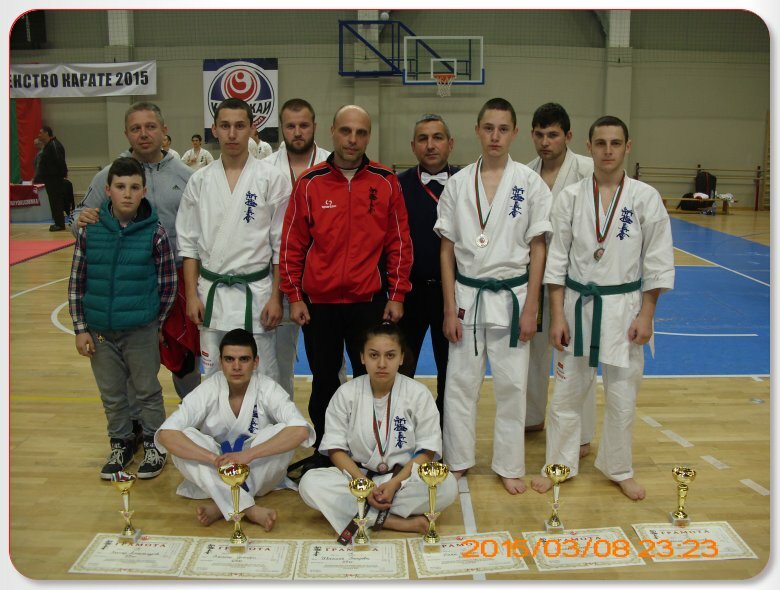 On 08.03.2015 in the small hall of "Arena Armeec", Sofia were held the National championships in Shinkyokushin karate for men and women - kumite and kata, juniors - kumite and kata, and men and women - second division kumite. The competition was very strong and in it on two tatami fought around 120 people from clubs of the whole country and members of the Bulgarian Karate Shinkyokushin Federation. SC Kyokushin Shumen's team made a very strong performance, winning 3 gold and 4 silver medals. 1.Kaloian Vichev in men second division kumite, who fought in four matches and was on a higher level than his opponents, winning his semifinal by ippon after a well placed ushiro geri, then prevailing in his final once again with ippon after a strong series of fists. 2.Kaan Shukri in juniors, 55kg category, who won his semifinal by avasete ippon - two vazaari, the first by djodan hidza geri, the second by chudan mawashi geri. 3.Dzhaner Shukri /two-time bronze medalist from European competitions/ in juniors, 65kg category, who decisively won over all of his opponents and became republican champion for the ninth time. 1.Ivelina Petrova in juniors, 55kg category, who had a very difficult semifinal match against Maria Argirova of SC Hamon Asenovgrad. Our girl managed to win by vazaari, but she was fouled a number of times by forbidden techniques and after an intervention by the doctors she was able to continue. In the end an old foot injury resurfaced and this undoubtedly affected the final match against Kristiana Laleva of SC Kyokushin Sevlievo, where Shumen's young fighter was fouled again and this severely affected her game. After the end of regular time in the given continuation our girl had to settle for second place. 2.Petar Aleksandrov in juniors, who showed a great deal of growth in his game over the past year. 3.Kaloian Georgiev in juniors, who brought silver medals in two categories for SC Kyokushin Shumen - both kumite and kata. The competitors of SC Kyokushin Shumen were able to take part in the National championships in Shinkyokushin karate for men and women - kumite and kata, juniors - kumite and kata, and men and women - second division kumite thanks to the timely help of "Agrofresh-A" ltd, Osmar Winery and "Pestitzid" ltd. Shumen's karatekas continue their preparation for the upcoming National championships for kadets and children up to 12 years of age, which will take place on 28.03.2015 in the "Mladost" hall in Shumen. Day of the Japanese culture, Shumen 28.02.2015 years. 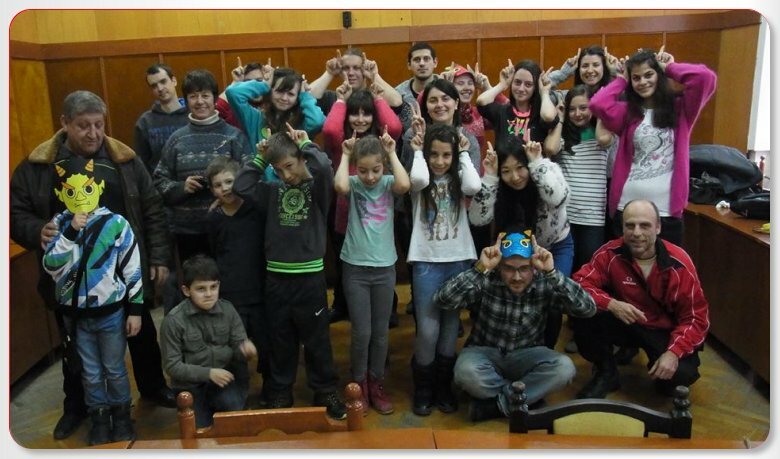 On 28.02.2015 in Shumen University "Episkop Konstantin Preslavski" was held a Day of Japanese Culture. The event was organized by Ms. Ukiko Tamamaru, a teacher in japanese language and culture for the Japanese association for international cultural exchange together with the Center for international collaboratio nand projects for Shumen University. The event was attended by students of the class in Japanese language and culture of ShU, children of Shumen clubs in eastern martial arts and curious citizens. The Day of Japanese Culture began with a presentation on the japanese holiday Hinamazuri, presented by the japanese teacher. The traditional day of puppets marks its beginning in ancient tradition the bears the name Hina Mazuri, which translates into "girl holiday". There are some theories as to the origins both of the festival and the puppets, which resemble the emperor, empress and their court. It is said that it started back in the beginning of the Edo period (1603-1867). As the years went by, the puppets became more complex, with the greatest collections being composed of the emperor, empress, the imperial court, musicians with their instruments, dancers and various furniture, including lamps, chests, food boxes and sometimes even litters. The puppets from the land of the Rising Sun are very diverse. Their types vary from babies and children, to miniatures, resembling members of the imperial court, heroes of fairy tales and japanese mythology. What's special about them is, that it is very rare to see puppets of demons. Karakuri are called large puppets with musical mechanisms. Gosho, which translates to palace or imperial court, are small and fat puppets, shaped like babies. Hina are the puppets made for the Hina Mazuri holiday. The classic Hina doll has a pyramid shape and is usually made from a few layers of fabric materials and is filled with hay or wood chippings. The Musha puppets resemble warriors - men and women, who are standing straight or are riding a horse and carry weapons. Ichimatzu are puppets that resemble youn boys and girls with the correct proportions and regular skin colour. Kokeshi puppets have existed for 150 years and find their origins in the north part of island Honshu. Kokeshi resemble young girls and are some of the most often bought souveniers from tourists. Daruma puppets have red bodies and white faces. They resemble the priest, who created the Dzen movement in budism about 1500 years ago. Part of tradition is, that when a girl is born in the family, she is gifted a number of Hina puppets, which are displayed in the houe of the family every year during the festival, which usually begins in the middle of Ferbruary. In contemporary japan, where production space is limited, some stores, who sell Hina puppets, offer them together with a special package for preservation. Hina Mazuri is a well known and popular festival, but because the its rituals are held in a family setting, unlike many other japanese festivals, this one does not gather big crowds. It is more of an occasion for a person to quietly watch and enjoy the beautiful and complex puppets, which are the heart of the festival. After the presentation under the leadership of the japanese teacher Ukiko and her friend Mariko all attendants had a chance to make and decorate a japanese puppet. At the end everyone had a chance to try some traditional japanese cuisine. The Day of Japanese Culture underwent with great interest in corpus 1 of Shumen University and the guests of the festival could once again come face to face with the ancient tradition as well as the modern culture in the land of the Rising Sun. Day of the Japanese culture, Shumen 07.02.2015 years. 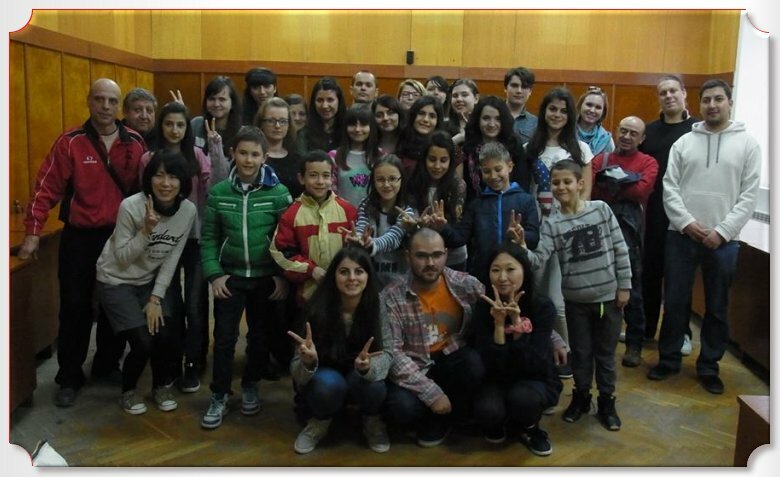 On 07.02.2015 in Shumen University "Episkop Konstantin Preslavski" was held a Day of Japanese Culture. The event was organized by Ms. Ukiko Tamamaru, a teacher in japanese language and culture for the Japanese association for international cultural exchange together with the Center for international collaboratio nand projects for Shumen University. The event was attended for students of the class in Japanese language in culture of ShU, children of SC Kyokushin Shumen and curious citizens. The Day of Japanese Culture began witha a presentation on an ancient japanese celebration Setzubun, showed by the japanese teacher. With it comes the end of winter and the start of spring. The celebration has a ritual meaning of "return of the Sun" and is tied to refreshing the body and mind, as well as purging evil. Today Setzubun is celebrated in various ways. With the ceremony, the ritual mame-maki, begins the welcoming of the New Year by the lunar calendar. This tradition is performed to cleanse all bad luck and allow happiness, prosperity and success into the house. In families, where there are small children, the mame-maki ritual usually turns into a fun and joyful activity. Someone (usually the father or grandfather) puts on a costume of a demon, then jumps and runs around in the room, while everyone else throws soy at him. In some schools the students make masks of evil spirits and they enjoy Setzubun to the fullest, throwing mainly beans. According to legend, after the mame-maki ceremony every member of the family has to eat as many soy beans as is their age at the moment. After the presentation, to the joy of all children, some of the students of the japanese class put on demon masks and everyone recreated the ceremony with a lot of laughter. There were alsoe traditional japanese games, which contributed to the general merryness.